A Compact Instantaneous Boiling Water Dispenser Tap Ideal as a Hand Wash Tap in Kitchens, Bathrooms, Toilets, Ensuites, Utility Rooms and other Domestic or Commercial Uses. 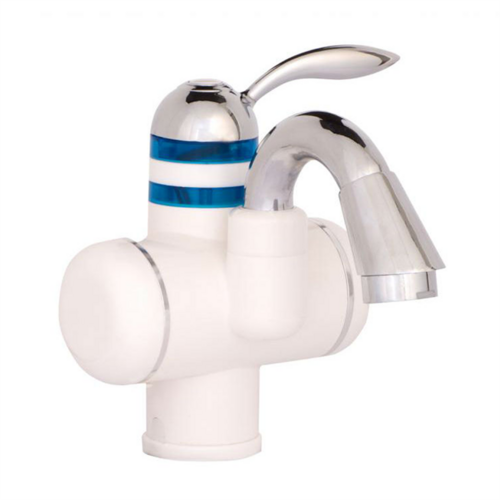 The TAP1 is the ideal replacement for a standard mixer tap in areas where a hot water supply is difficult or impossible to install (e.g bathrooms, en-suites, utility rooms, garage conversions, and other domestic uses. Requiring a cold water supply only, the TAP1 heats water (<50°C) directly at the point of dispensation, saving money and energy on hot water storage costs. This stylish model features a blue LED heating indicator, an ergonomically designed handle for ease of use, intuitive heat setting controls with cutout feature, a swivel spout for directional flow control, and is supplied with a standard 13A plug for ease of wiring. Direct replacement for Standard mixer taps - Fits into most sink units. Electrical World Replies: Thanks for the question, the flex is 1 meter long on this. Does it shut off automatically when not in use? Does it use any electricity when not in use?